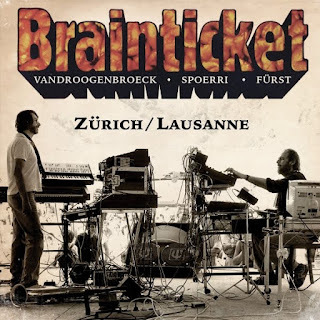 PROG ROCK MUSIC TALK: Two Full Length Unreleased Live Recordings From Krautrock Pioneer Joel Vandroogenbroeck & Brainticket Finally See The Light Of Day! Two Full Length Unreleased Live Recordings From Krautrock Pioneer Joel Vandroogenbroeck & Brainticket Finally See The Light Of Day! Los Angeles, CA - In 1980, Belgian-born multi-instrumentalist and songwriter Joel Vandroogenbroeck revived his early ‘70s avant-garde electronic act Brainticket alongside longtime member Willy Seefeldt, jazz musician Hans Deyssenroth, and Swiss jazz & electronic aficionado Bruno Spoerri. Three years later the quartet would perform their very first show in a landmark performance at the “Computer und Musik” symposium in Zürich, Switzerland. Though long a part of Brainticket lore, this concert has never before been released on a commercial format, that is, until now! Purple Pyramid records is proud to release this incredible live performance, matched with an equally historic performance in 1984 at the Théatre de Beaulieu in Lausanne, Switzerland of Vandroogenbroek and Spoerri plus Peter Fürst. Both of these full-length concert recordings contain improvisations and compositions not found anywhere else! Zürich/Lausanne is available as both a 2CD set as well as on all digital retailers! A division of CLEOPATRA RECORDS, Inc.